An English schoolteacher meets his lookalike, a French count; and unwillingly swaps identities with him. Captain Richard Pearson: Captain, are you surrendering? Do you ask for quarter? John Paul Jones: No sir! I have no yet begun to fight! 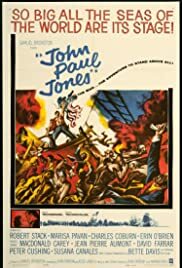 the other reviewer hit the nail right on the head, this movie is full of historical inaccuracies, the house of burgess is in Williamsburg, Virginie, and John Paul Jone's brother lived and is buried in historic downtown fredericksburg, a good two hour drive from Williamsburg. the Virginie love triangle is rather silly. despite the flaws, i've liked this movie ever since i was a little boy and saw it on TNT during one of the fourth of July marathons... maybe i like my heroes a little stiff, but i thought Robert stack did an alright job. although, it would be nice to see the movie remade with a little more historical accuracy, and maybe have Mel Gibson or Russel crowe or a Scottish actor play jpj... he'd sound a little more accurate, i can watch this movie over and over again.